Sometimes, transparency is so well achieved that you have to put a sign that something transparent is really there. 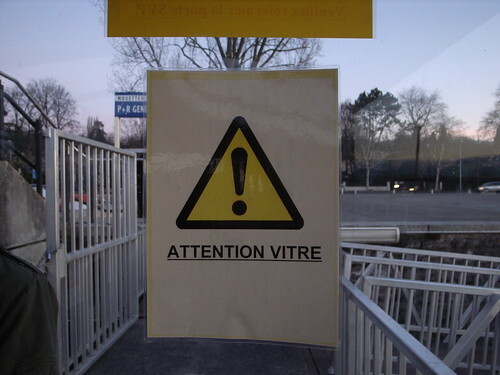 In the example above, the glass is so transparent that a sign has to be put indicating the presence of "glass" (in french, it says "Beware! Glass"). Why do I blog this? This example is interesting because it's the same problem faced by digital services in contemporary cities. It's also an intriguing design issue, to balance transparency and visibility is a bit tricky and sometimes external factors could help: in this case the presence of dirt/dust will inevitably lead to the removal of the sign.